I spent the MLK holiday reading for class... but not in a negative whining kind of way. The rain somehow made it more enjoyable to sit inside, open my book, sip my coffee, and enjoy a crossaint. Apparently the rain is supposed to last until wednesday, which means snow on the mountaintops and a free carwash for all. I took a break from reading and suggested taking some photos in the rain to document signs of "winter" in southern california. I got wet regardless of the umbrella but I guess it was inevitable. I don't usually wear print but recently felt that I could spice up my closet a bit and purchased the silky top from Urban Outfitters... And the pants are the perfect mix of fit and comfort, for a steal of course, at forever21. 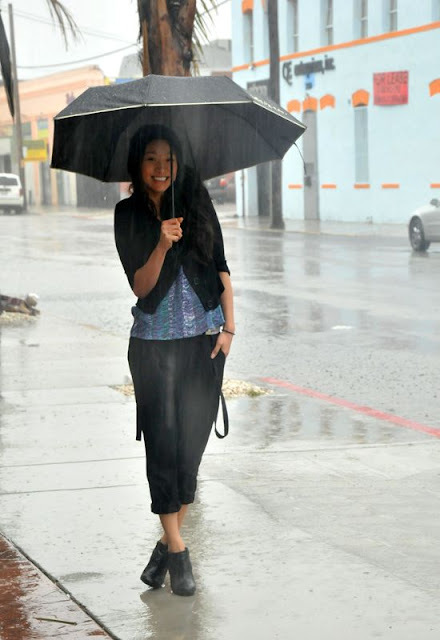 So, today's post is dedicated to MLK "I Have a Dream" and the seldom occurring rainy weather. happy monday. Yes! Yes, yes, yes, yes, YES!! I absolutely love it when people make rain fun! What could be better? 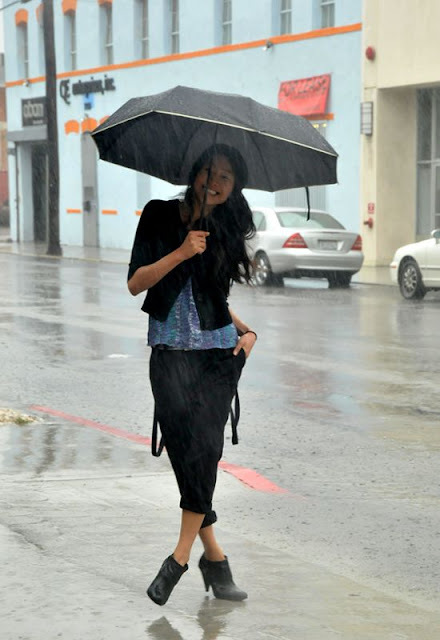 Only, Rain with a cute outfit of course. Angela you've done it again! Can't wait for the next post! love the photos... esp the 2nd one. Rain+airport+holiday... bad mix. High waters on a rainy day... good one. loookin like a korean actress haha awesome. I love this outfit and the photos are so cute!! !